Complementary Therapies in The Chew Valley; Osteopathy, Chiropody, Acupuncture, Massage, Reflexology, Sport Massage. Based half way between Bristol and Bath, a short drive from the Mendips. *Thursday and Friday clinics are held on alternate weeks. From 1st Jan 2019 all missed appointments or those cancelled with less than 24 hours notice will incur a charge of £10, which will be added to your next appointment fee. Vivienne qualified in 1999 from the SMAE INSTITUTE which is one of the leading podiatry colleges in the country. She became a member of the HPC (Health Professions Council) in 2003. This is a regulatory Government body set up to maintain standards across the profession. The title of Chiropodist/Podiatrist is protected and can only be used by individuals who are registered with the HPC. 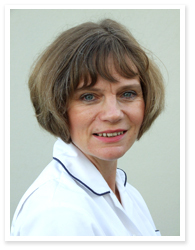 Vivienne has worked at Chew Valley Therapies Practice since 2004. Due to other commitments, Vivienne Jones does not work full time or out of hours, but does run a very full list. Therefore please be advised that under normal circumstances, while her waiting list is shorter than NHS Chiropodists, it is usually between FOUR and EIGHT weeks before there is an available appointment, and there is normally a waiting / cancellation list for earlier appointments several patients long. It is VERY UNUSUAL that we are able to offer an appointment with her within 7 days. We therefore ask patients to call for appointments well in advance of the need becoming immediate to avoid disappointment. Anything urgent should be seen by your GP. We apologise if this causes inconvenience but Thank you for your co-operation. Chiropody/Podiatry is the diagnosis and treatment of most foot conditions. This includes an in depth knowledge of the lower limb, the foot and the muscles, bones and ligaments which make up the foot, as well as identifying and treating the abnormal conditions which result from problems in foot health, gait and other factors such as poor footwear. WHAT CAN A CHIROPODIST/PODIATRIST TREAT? WHAT HAPPENS WHEN YOU SEE A CHIROPODIST/PODIATRIST? You may have had a doctor's referral to see a chiropodist especially if you are diabetic and your GP may be concerned about some aspect of your feet i.e. toe nails or callous build up, which requires treatment. In other cases you may just have some localised pain or discomfort in your foot and require professional advice and treatment. You may simply have got to the stage where you cannot easily reach your toe nails any more to cut them, in which case you can just ring and make an appointment. Your first visit will probably be the longest - approx 30-40 minutes, as you are required to fill out a patient record form/questionnaire and the chiropodst will want to give you a full foot health check and assessment. Thereafter, each appointment you have will be 30 minutes. The chiropodst will identify and treat your condition. If you have a number of conditions requiring attention which will take longer than 30 minutes, the chiropodist will give priority to the most pressing/severe problem and you will be required to come back as soon as possible to complete the treatment. However, this is a rare occurrence and usually all conditions can be effectively treated within the given time. Your treatment will be explained fully to you. You may require regular maintenance appointments i.e. every 6 to 8weeks to ensure your feet remain healthy. Any side affect from any treatment given will be explained to you. You may be required to keep pads or dressings on your foot for a period of time or come back over designated time periods for further treatments. Advice for specific conditions and any exercises that are necessary will be provided. You may be required to change footwear and shoes to help your condition. Practising Chiropodists/podiatrists now have to routinely participate in Continuous Professional Development (CPD) every year. This has come about since the Profession was regulated by the HPC (Health Professions Council) in 2003. The HPC makes sure anyone who calls themselves a Chiropodist or Podiatrist is fully qualified and is a competent practitioner. Vivienne is also able to offer appointments at Chew Medical Practice (GP Surgery) in Chew Stoke. Please note that this is still a private practice clinic, and the appointments are not available through the NHS. Appointments to see Vivienne at Chew Medical Practice are bookable ONLY through Chew Valley Therapies Practice, and are part of her normal weekly list with us. Please contact us or click here for more details. Email Us Queries, cancellations or changes of appointments must be made BY PHONE. Please do NOT email us about appointments. Times shown above are our OFFICE hours during which someone will be on duty to deal with any enquiries. For individual Therapist's hours, please see their individual pages. Gift Vouchers can be purchased from Reception for any value (min £5) for any of our Therapies, and are valid for 6 months from the date of issue. Contact us or call in for more details. Copyright Chew Valley Osteopathic and Therapies Practice. All Rights Reserved. Picture Window theme. Powered by Blogger.